KoopaTV: Nintendo Account Registration! Miitomo too. By LUDWIG VON KOOPA - Opened February 17! Sign in with your NNID. The rest of those options are for people who don't have a Wii U or 3DS. ...Good to see that Google+ is considered centrally relevant, though. No one is logged in at the start, because your Nintendo Network ID and your Nintendo Account aren't exactly equivalent. 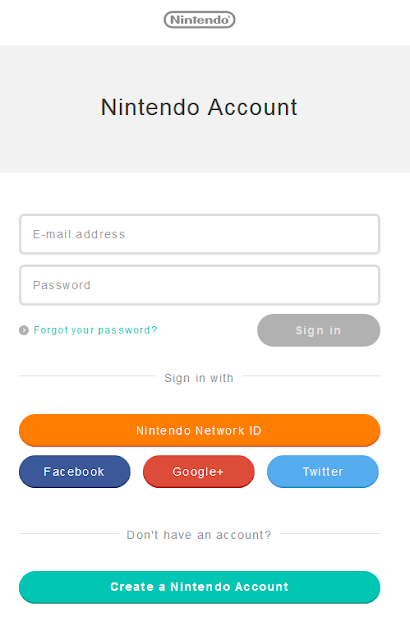 When you do sign in with Nintendo Network ID, you'll be brought to the Create a Nintendo Account with fields already populated for you, depending on what you registered into your Nintendo Network ID. There's nickname, e-mail address, date of birth (which you cannot change once it's auto-populated, so if it's wrong you need to call Nintendo or create a new account without associating it with your Nintendo Network ID), country (also cannot be changed), gender (it's binary plus you saying you'd prefer not to answer), and timezone. You hear that, kids? Go away. They haven't written it yet. Or don't want to spoil it via Terms of Service. 'kay, I gotcha. Once you accept the Terms and register, a four-digit verification code is sent to your e-mail. Put it in, and you're done. There's one more thing you can do, though. What's that Miitomo preregistration offer they mention in that screenshot? Well, here's some more information about it. 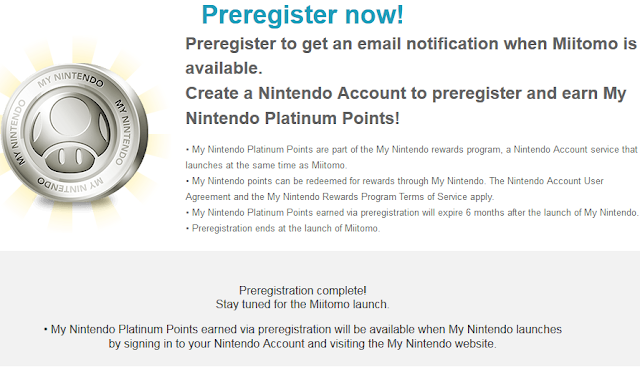 The gist of it is, if you go to the Miitomo preregistration site while logged into your account and preregister, you'll be signed up to a Miitomo newsletter to your e-mail. In return, they'll give you some My Nintendo Platinum Points. These will be usable to redeem game-related (not games themselves) things, though I doubt they'll give you enough to be able to redeem anything with just the points you get from preregistering. Maybe it'll be just enough to get an extra shirt in Miitomo, just so you'll get scaffolded into it. Preregistration complete! Stay tuned for the launch. The platinum My Nintendo coin graphic looks pretty cool, actually. I think I need to talk more about Miitomo, because when I tried to explain it, we had incomplete information and I didn't give it the respect it doesn't deserve. This is clearly not meant for the core gamer or Nintendo fan. In summary, the game is about taking screenshots of your Mii and your friend's Mii and sharing them on social media. You can dress your Mii by paying for clothes with micro-transactions. It's like a stripped down Tomodachi Life, except the only Mii involved is your "look-alike" and there's no actual gameplay, just dialogue inspired by you answering questions. Who wants to make their Mii look or act like you, anyway? That's boring, and it's what #miiquality people wanted. You really wanna follow their lead? When customising a character in a game, the majority of gamers in a GameFAQs poll don't have those characters look like them. Why do they need to invent the term “Miifoto”? Just call it a screenshot like a normal person. I think we can all expect that this will get a lot of downloads, but minimal active player engagement. That might just be what Nintendo wants: If people waste their money on in-app purchasing garbage in Miitomo, that's a bonus. The real goal is to get people signed up for these Nintendo Accounts, get them on these newsletters, and have these mobile folks in the (spectacular buzzword incoming) ecosystem. You don't even have to play Miitomo more than once to get enticed in that. That's good, since that's probably one less the amount of times you'll touch it, if you download it at all. Ludwig is a Nintendo Account member. Are you? Get out there and participate in the FUTURE of the Nintendo ecosystem! He openly hopes that the other smartphone games won't be worth anyone's time or be any good, both because he has no respect for mobile gaming and because he doesn't have a smartphone so he wouldn't be able to play them. Do you know what's an even better thing to join than the My Nintendo Rewards Program? Why, it's the KoopaTV Loyalty Rewards Program! Nintendo is enabling greater Mii customisation features on the Nintendo Switch. Miitomo has an end-of-life time. Made my account but did not preregister for Miitomo yet. And I made my Mii to look like me in real life as much as possible for a Mii to look like that. The only thing my Inkling has that resembles me is my brown irises. Are you gonna preregister for Miitomo? I assume that the Platinum Coins will be usable for non-mobile purposes as well, though they have a 6-month expiration date so it's unclear if there will be non-mobile uses for it within 6 months of March. Thanks. Who knows, people are going to be recording and uploading videos on youtube of the Nintendo NY grand reopening. There is an old Nintendo World Store video with me in it recorded by someone else. Who knows, if I make it on to one of these new videos I may point out to you which one is me. You'd be comfortable with that? Depends on how trustworthy the person I share it with is. Congrats, I found you trustworthy. Wanna see how your different Miis interact? The only way to have control of more than one Mii is to have more than one phone and account. Nintendo is doing more to sell mobile phones than 3DSs. Do you feel better inside? It'll add to your pile of e-mail spam. You can get e-mail spam from KoopaTV, too, if you sign up for our e-mail subscription. It just sends you the article published in the e-mail at about 12:30 PM.